Escape the noise and stress of Osaka with this relaxing, 7-hour, private day trip exploring the mountains and hot springs near Kobe. Ride in your private luxury vehicle into this mountain escape, enjoying the views from on top of Mount Rokko, visiting the nearby Kobe Botanical Gardens and soaking your worries away at Arima Onsen hot springs. 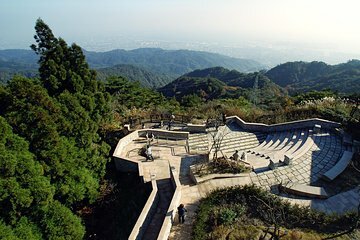 Get picked up in the morning from your central Osaka hotel as you travel aboard a luxurious private vehicle to your day’s first stop at Mount Rokko. You’ll ascend to the top of this Japanese peak aboard a historic cable car, in operation since the 1930s, admiring the beautiful panoramic views from on top. Continue your day amidst the lush greenery of the Kobe Botanical Gardens, also located at the summit of Mount Rokko. Finish with relaxation time in the hot spring baths of Arima Onsen. Full a full run-down of your trip itinerary, please review the details below. favorite tours. I highly recommend this for anyone who was to see Kobe Mts and one of the best hot springs in the area. Great tour Kobe mountains tour with amazing relaxation experience in Osen. Kevin is a great tour guide with excellent knowledge of the area. Provided very flexible pick-up and drop-off location in Osaka. Would definitely recommend this tour to a friend. Kevin is a great guide and translated all of the nuances of a uniquely Japanese experience into an American/Western perspective. Great trip!